UPDATED: Huawei's best smartphone to date - but not quite the perfect business working device. Huawei has been making major strides in the smartphone market for some time, with a huge range of impressive devices proving to be popular for Android fans around the world. Having revealed earlier this year that it is now the world's third-largest smartphone vendor, the impetus was on the Chinese firm to reveal something special with the launch of its latest flagship device - the Huawei Mate 10 Pro. Straddling the border between smartphone and phablet, the new device is the most powerful Huawei mobile to date, sporting an updated design alongside upgraded hardware - with the company also keen to promote super-smart new AI tools within. But can the Huawei Mate 10 Pro keep up with its predecessors and work as a business/mobile working titan as well as being a beautiful consumer device? The Huawei Mate 10 Pro is firmly positioned at the company's flagship offering, and as such features a highly-polished design and build. The firm has altered the design from the Mate 9 device, with the Mate 10 Pro now sporting a slightly curved glass back, instead of the metal body that came before. Although this has made the device slightly prettier to look at, it could prove troublesome for anyone prone to accidentally dropping their device, and could lead to an expensive repair. This possibility is also raised significantly by the fact that the Mate 10 Pro appears to have a mind of its own when placed on its back on even the most minuscule incline (for example on top of a wallet), which left us scrambling to save the device before it plummeted to the floor. This is obviously not an ideal situation for anyone who might be using this device when out and about - and our advice is to invest in a leather or plastic backed case immediately. The Huawei Mate 10 Pro packs a 6.0in display which is a significant step up from the Mate 9, with the screen now covering more of the front display that ever - a stunning 80.9 per cent screen to body ratio. The side bezels are non-existent, although unlike the Samsung Galaxy S8 there is no curved display, with the 1080x2160p display stretching nearly to the very edge. That resolution equates to 402ppi, and means that there's no 4K display, unlike some other phablet devices, but to be honest this is barely noticeable, as the screen is incredibly detailed and bright, even when streaming HD video. The Mate 10 Pro is also slimmer and lighter than its predecessor, weighing in at just 178g, and just 0.31in thick. Its size still means that it will bulge somewhat if you're keeping in a trouser pocket, but it's overall much more compact than past devices. One crucial extra detail is that Huawei has followed Apple's example and ditched the 3.5mm headphone jack for the Mate 10 Pro. In an era of Bluetooth headphones, this may seem like a minor issue, however if you're looking to use this phone with a headset for business calls, you may be out of luck. Huawei does provide a USB-C adaptor for traditional headphones, but this doesn't ship with the device, meaning you'll be needing to shell out more if you're looking to do this. Along with a revamped design, the Huawei Mate 10 Pro has been given a major upgrade when it comes to the hardware within. Inside, the phone sports Huawei's latest octa-core Kirin 970 SoC, the most powerful chip ever made by the company - backed up by a huge 6GB of RAM. Huawei says that the Kirin 970 is twice as fast as Apple's latest iPhone 8, and our time with the Mate 10 Pro has shown it to be an incredibly fast device - but more on this in the experience section below. Huawei has made the decision to remove the SD-card slot for the Mate 10 Pro, which may upset some users - however the device ships with an enormous 128GB of internal storage (as well as Google Photos pre-installed) so there's plenty of room for your apps, photos and more. Where the Mate 10 Pro really stands out, though, is in its battery life. The device an enormous 4,000mAh power unit, which far surpasses many of the other devices on the market today. Our tests found that the battery was able to easily provide a full day's power when in heavy use (working, watching video, and using social media) and even two days of usage when in casual use. Recharging is fast and easy, with Huawei's supercharge function able to power up the device half-way with only half an hour's charging. This on its own is enough to recommend the Mate 10 Pro as your main device, and coupled with the massively upgraded hardware, definitely helps the phone stand out from the crowd. With all this hardware power behind it, it's fair to say that using the Huawei Mate 10 Pro is often a breeze. That 6GB of RAM means that the device is easily set up to deal with running multiple apps and services at the same time, whether that's work, social media or even gaming. Launching and switching between apps is fast and easy, and thanks to the huge screen, multi-tasking is simple to set up and use. The Huawei Mate 10 Pro, as with many of the Chinese firm's other devices, runs the company's EMUI 8.0 software on top of Android 8.0 Oreo. This does mean that the device ships with a large amount of Huawei's own semi-bloatware tools and services, but these can be easily hidden away in a folder. However it does include the Google Assistant, which, coupled with the Kirin 970's AI capabilities, look to make the Huawei Mate 10 Pro one of the smartest devices around. However handling the device was also often a problem, as the slippery polished glass rear panel was prone to slide around when not placed on a completely flat surface due to its curved back. This should be fixed with an external case - but as mentioned above, did make for more than one hairy moment when reviewing the device. These are easily-addressable issues, however, and hopefully Huawei is able to correct them soon. There's no denying that the Huawei Mate 10 Pro is a hugely impressive device, with hardware capabilities surpassing many other devices on the market, coupled with a gorgeous design that will make it stand out at home or in the office. 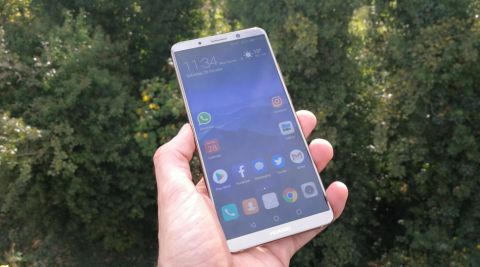 Huawei has made significant strides from the Mate 9, creating a more compact and intelligent device that could make a definite claim towards being the best Android device on the market today. There are some minor niggles, specifically the slippery back panel, and usual EMUI bloatware, but for anyone willing to look past this and pay the high price tag, the Huawei Mate 10 Pro is definitely one of the best Android devices ever made.